This is how mechanical steering, or rather Mercedes-Benz mechanical "worm and sector recirculating ball steering", works. Any rotation of the steering wheel is transferred via the steering column (Figure 1: 1) to a steering worm (Figure1: 2). The steering worm is - in simple terms - rather like a screw with a thread. The counterpart to the screw is formed by the nut - here called the steering gear nut (Figure 1: 3). As a link between the steering worm and the steering gear nut, steel balls are embedded in the thread, and these help to reduce friction during the turning motion. The steering worm and steering gear nut have, as it were, a thread with ball bearings. The steering gear nut is so fixed that is can not move "right round" during the turning process. And now just try to picture it: When the steering wheel is turned, the steering gear nut moves along the steering worm. The steering gear nut has a row of teeth on one side meshed directly with the sector on the Pitman shaft (Figure 1: 4). All movements of the shaft are transferred to the wheels via the drop arm (Figure 1: 5) and the steering linkage. The advantages of worm and sector recirculating ball steering are based on two points. First of all, as already mentioned, there is very little friction between the steering worm and steering gear nut due to the system of "recirculating balls", thus making for light, positive steering. Furthermore, such steering has a constant reduction ratio within the steering box. Correctly adjusted worm bearings have no clearance and no pre-load. 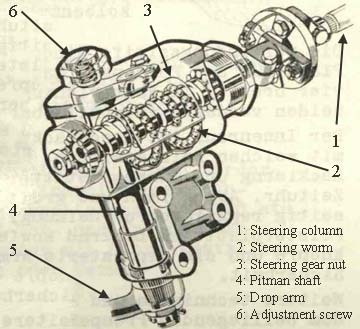 The Pitman shaft (Figure 1: 4) adjusting screw (Figure 1: 6 ) must be adjusted when the steering wheel is in the straight ahead position; tighten the adjusting screw until the spring is fully compressed and then back off approximately 3-4mm, measured at the circumference of the adjusting screw.